Non-cash, recognition only for Taiwan residents. Please note that Taiwan residents are also eligible for all cash awards. The Hsuehshan Tunnel is the main artery between Taipei & Yilan, but it can be severely clogged. Build new apps to help drivers avoid congestion and improve traffic flow in the tunnel. Many of the seven million residents in the Taipei metropolitan area (Taipei, New Taipei City, Keelung City) and tourists travel to the popular Taiwanese vacation destination, Yilan, for long-weekends and major holidays. Most frequently, this trip is made by car or public transportation through the Hsuehshan Tunnel via Freeway 5. As a result, the Tunnel (and the area around it) is severely congested during these times, increasing travel times from 30 minutes up to 2 hours. The alternative is a winding shoreline highway, or an equally dangerous mountain pass, that take much longer and is more dangerous due to their cliff-side locations. The Institute for Information Industry of Taiwan and Ford are committed to making travel in and around the Hsuehshan Tunnel better. The Ministry of Transportation and Communications (MOTC) of Taiwan has already created monitoring systems for traffic that can be accessed by the public, provided public transportation options via bus and train, etc. But it’s not enough. Weekend and holiday traffic continues to bog down the tunnel and expanding it isn’t an option. Now, for the first time, Ford and the Institute for Information Industry want you to get involved. With newly released resources, including three-months worth of weather & traffic XML data, plus a plethora of information about the Hsuehshan Tunnel, Freeway 5, and the alternate routes (Highway 9, Highway 2, and Highway 2C), developers like you can focus your problem solving skills on the Hsuehshan slow down. Despite the obvious infrastructure component, we believe software and service-oriented solutions can make a big impact on tunnel traffic. For example, how could you incentivize public and private group transportation -- not only to get to and from Yilan, but within the city as well? Ready to learn more? To get started, take a look at the requirements below and then head over to the Resources page for access to the newly released traffic and weather XML data and more. Employees of Ford, the Institute for Information Industry of Taiwan, and Devpost are not eligible for prizes. Applications that have been submitted to a previous Ford ChallengePost or Devpost competition are not eligible for prizes (see list). A submitter may enter a different application, but no applications that have been previously submitted will be accepted. 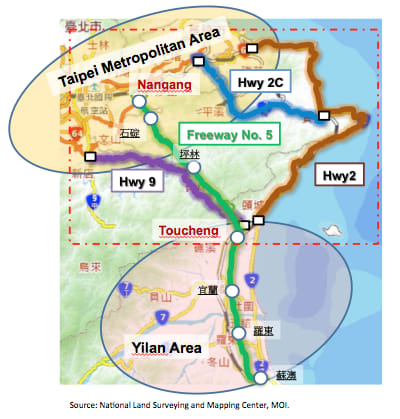 Main Requirement: Submitted solutions must focus on relieving the extreme traffic congestion on the Taipei-Yilan Freeway and in the Hsuehshan tunnel during the peak travel days, and promoting more efficient transportation between and within the Taipei metropolitan area and Yilan, a popular touristy and highly residential city. A demo video (hosted on YouTube, Vimeo, or Youku. Your video should include an explanation of the problem addressed and a demo that walks through the main functionality of the solution via screencast or video. You must also submit at least one image/screenshot of your working solution. A way for Devpost to install/access your application for judging and voting. Previous Ford Competition Entries: Solutions that have been submitted to a previous Ford ChallengePost or Devpost competition are not eligible for prizes. You may enter a different application, but no applications that have been previously submitted will be accepted. New & Existing Solutions: Solutions may be newly created or pre-existing. If you are submitting an existing solution (developed prior to this competition), your solution must include new features/functionality added after the submission period began, which specifically focus relieving the extreme traffic congestion on the Taipei-Yilan Freeway and in the Hsuehshan tunnel during the peak travel days, and promoting more efficient transportation. If you are entering an existing solution, you will be required to explain the new features in the submission form. Register to access important competition updates. Check out the Resources page for information on the Hsuehshan Tunnel and never before released traffic/tunnel data from the Institute for Information Industry in Taiwan. CTO, VP&GM, Quanta Computer Inc.
Includes the extent to which the solution could improve traffic in and around the Hsuehshan tunnel.